The Shoe Fiend is at first possibly difficult to recognize. Until you open the closet and settle your gaze upon what looks to be a dragon's lair for shoes. They may be in a big pile, or most likely carefully stored and archived. Shoe boxes, shoe bins, shoe caddies, the the storage options are varied, but the result is always the same: a woman (or man) obsessed with shoes. Are YOU a shoe fiend? My realization has only been recent- that I indeed am a fiend of shoes. I do love them. I love wedges, platforms, platform wedges, boots, booties, a fun pump, a cool stiletto, a nerdish sneaker, a ballerina, a boat shoe, a loafer, a loftie, a shortie, shootie, a shoe. If it's a shoe, chances are, I am going to love it. I thought my shoe collection was modest. Well, modestly let me share this: I have more boots and shoes than I have outfits to wear in a month. And that's NOT counting the pairs I've purchased in the intent to re-sell, in my size, so they haven't QUITE made it to the inventory, just in case I might need to wear one for "an outfit post." Shoot, I have so many shoes, that I'm losing room to store clothes in my closet. Dear friend, or foe- I am a shoe fiend. 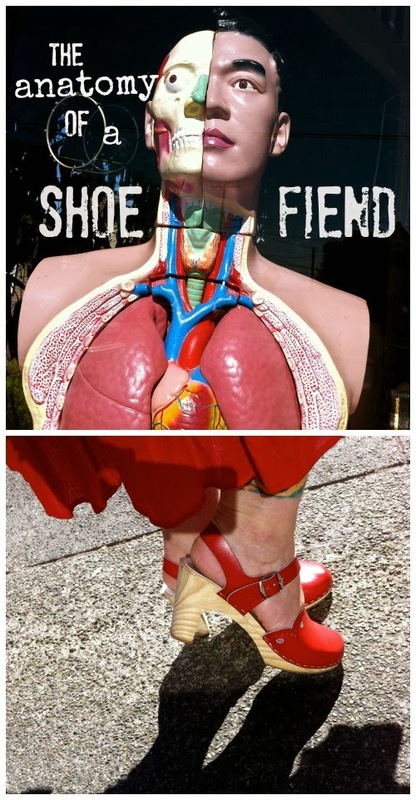 A shoe fiend has a fascination with footwear- and tends to specialize in her/his obsession. The fiend may fixate on a certain heel, print, color or material or a specific maker. A shoe fiend has more shoes than occasions to wear them. A shoe fiend feels giddy when first opening the box of her newest acquisition- it is a heady, nearly intoxicating experience when putting them on for their premier voyage. 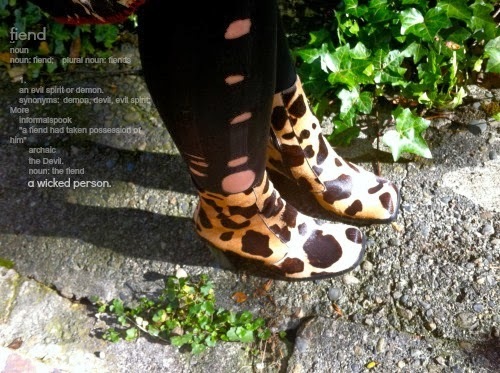 The shoe fiend may think of shoes constantly- shopping for them at charity shops, online, in friend's closets. Some have even been known to host "Shoe Shine" parties, showcasing all manners of fabulous shoes, and their fiendish (however friendly) wearers. Shoe Fiends can be easy to spot, and are hard to ignore. Just look down and admire- they are sure to be wearing a pair of killer kicks. Now it's YOUR turn to shine. 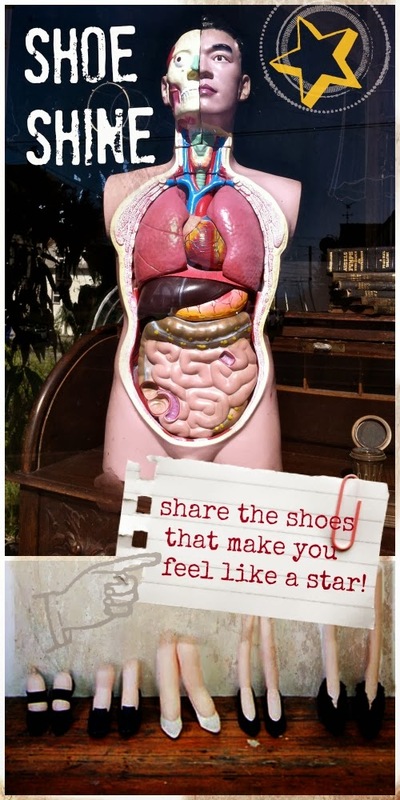 Add a link to you in a pair of shoes that make your day, your night, your life- and please share in the comments your opinion of what makes a shoe fiend. Thank you for your participation! I'm a major Shoe Fiend - I think I am close to 90 pairs of shoes! I have added my very first pair of Fluevogs (acquired about 10 years ago) to Shoe Shine! So appropriate! Of course I'm a shoe fiend! 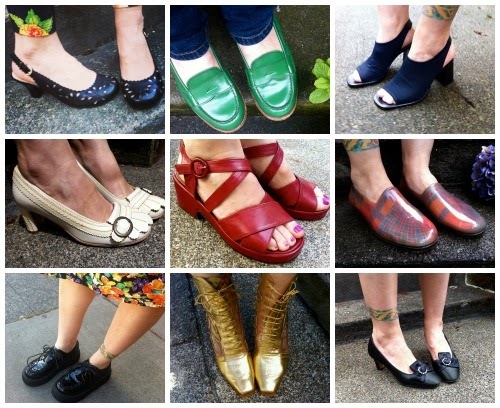 I was a high heel shoe fiend until I became disabled. Now I have to find interesting flat shoes, with flexible soles, that are easy to fasten, have some arch support... and still look good. You'd be amazed at what a collection I've amassed! My heels? In boxes in storage. Even after five years of disability, I can neither bear to look at them nor to part with them, so great is my grief at no longer being able to wear them. Ummm…yeah…shoes…no, I don't have too many. Is that even possible? I've included a shot of some of my friends here when I did a post on my closet. BTW…my husband is just as much of a shoe fiend as me…I need to do a post on his shoes. I love shoes. Handbags, not so much. I can never have enough shoes <3. I'm obviously not trying hard enough to be a shoe fiend. With your permission, I'll get to work on adding to my collection ASAP. I'm afraid I am a disgrace to women the world over, shoes, chocolate & handbags just don't bother me. The last time I bought a pair of shoes retail was 3 and a half years ago (and they were reduced to clear)! My focus never used to be on shoes, but somehow that has changed recently and I'm adding shoes to my collection in rapid speed. I love how they can transform a look and make an outfit edgier, chicer, elegant etc. Total shoe fiend here. Lately I've been finding WAY too much temptation! I too am happily a shoe fiend. As a collector, this category has not been neglected. Thanks for hosting Shoe Shine Bella, and providing a platform for the accessory that embraces our feet. I just had to repost my "Shoe Fetish" post for your link-up, as I, too, am a bonafide shoe fiend...and I'm proud of it! Still...how fun it is to see that we're not alone. I especially love your red Etsy sandals. Thank you, and keep the shoe posts coming! Also a shoe fiend. Zappos and I are best friends. Love seeing all the great kicks here today! Thanks for hosting, Bellisima Darling! I have exactly 47 pairs of shoes, all but 2 of them thrifted. As of yet, I have no organization for my collection---so consequently I am always pawing through the pile, looking for the missing mate for the pair I want to wear that day, ha ha! Every woman loves shoes. The more the better. You would laugh if you saw my shoe closet: lots and lots and lots. I like your cream pumps best (and the red clogs... feeling right at home haha). By the way, I am linking to Shoe Shine in my next post (next Monday) as lots of people have already visited my post of this week. I am soooooooooo glad to see the shoe shine comunitie growing. Will you join Share-in-Style Friday. Jon wants to show off his latest second-hand find, snakeskin boots by R Soles! He's definitely more of a shoe fiend than me! I think I'm not a shoe fiend at all, because I try to save my energies just for a few pairs, and I own not more than ten pairs of maryjanes and five booties, but I still love so many shoes and booties! I've always been a huge fan of martens, and fly london booties, and clarks, and El Naturalista, and Art!, and many others!! Thanks for giving me the heads up about this on Facebook! I'm enjoying these linking up thingies!! You know me, I'm a total shoe fiend... At 200 or so pairs, I would even classify myself as insane! I am a total shoe fiend...it's a bad habit that I'm not trying to break. Handbags too.